The former prison building Blokhuispoort in Leeuwarden hosted 14 interns from University of Limerick in Ireland, Universitat Politècnica de Catalunya in Spain, Linköping University in Sweden and NHL University of Applied Sciences in the Netherlands, as a part of the Learning for Innovative Design for Sustainability (L4IDS) Erasmus+ Knowledge Alliance project. 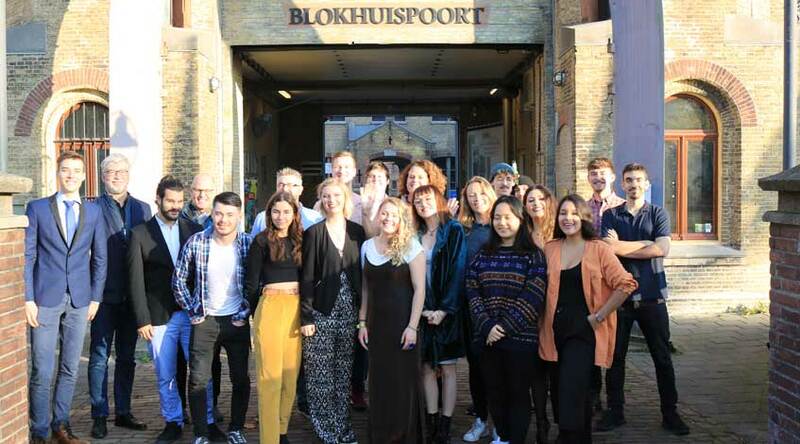 The interns shared the studio space with the Frisian Design Factory for three months from September 3rd to November 15th, 2018, where they worked on challenging assignments and attended a series of circular design lectures and workshops. Three Dutch organisations, Lankhorst, House of Design and LIMM, provided the interns with design questions. Team Lankhorst worked on defining a new market for the company and designed high-end street furniture from recycled plastics. Team BeeStreet, who received their assignments from House of Design, has worked on dealing with extreme weather conditions on the city level and designed an entire rainwater irrigation and storing system. Working together with LIMM and Biocas project, Team Biocups has designed a new drinking experience by means of recycled plastic cups within the context of music festivals. The final presentations took place on November 15thth at the Blokhuispoort in Leeuwarden and then exhibited in Frisian Design Factory for local entrepreneurs and fellow students of NHL Stenden University of Applied Sciences.